I lieu of posting today or this weekend, I am taking the holiday off. This year I have so many things to be thankful for, and I want to take special time to reflect on them, rather than frantically clicking at a screen (which is my day job and hobby). My dear family. From my amazing husband, to my siblings and mother, to my huge extended family and in laws. I am so glad to be able to see so many wonderful faces this week, and to talk with people who I love and who love me. My growing baby! We are 19 weeks along now, and I’m feeling the baby kick. I can’t think of a more wonderful thing than turning our two-person family into a three-person one. I’m so thankful for our health and wellbeing. My friends. There are a few people who have solidified themselves in my life over the past few years, making the effort to stay in touch, providing advice and sharing concerns. Friends of that nature are rare (for me at least) and I am so thankful to have people like that in my life. My wonderful Church family. From the parish nurse who asks me how my doctor appointments are, to the group leader who is always available via text. I love seeing new and familiar faces at each gathering, and chipping in together to help people in need. I can’t wait to start Christmas bible study next week! My Amazing online community. I started this site years ago to fulfill some pent up creative energy. Since then it has become one of my daily pleasures, and one of my biggest motivators. The readers here, the communities of other bloggers, you all inspire me to keep doing something I love in the face of all life’s hectic demands. That is a huge boon to my personal and emotional fulfillment. My Job. While my blog might be my creative outlet, I am still happy for the opportunities I have to work as a web & graphic designer every day. I am able to keep sharp, to learn new things and meet new challenges. Not to mention it pays the bills. ;D I also have a relatively flexible work place and I am very thankful for that. Well, I could go on forever listing all of the wonderful things in my life. But suffice it to say that I am blessed, and I hope to spend the next few days (and every day) reminding myself of that. How about you? 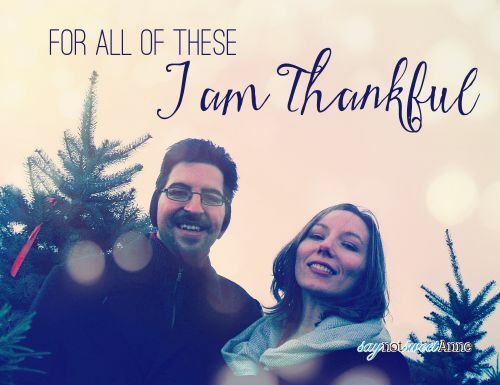 What are you thankful for this year? Please leave a comment and we will share in our blessings together. Thats a lot of things to be grateful for!